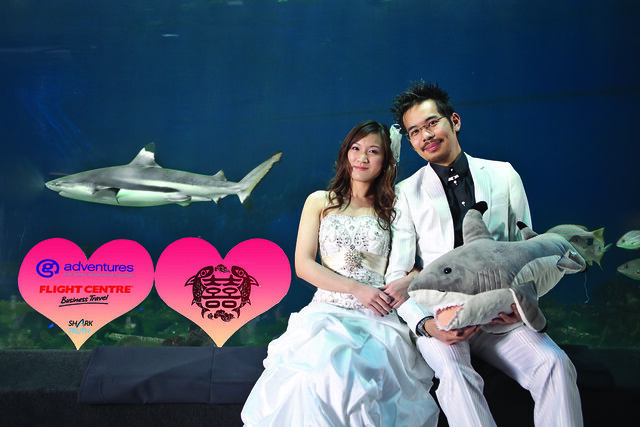 Welcome to the Happy Hearts Love Sharks Wedding Contest 2012! Congratulations to Amy & Jackson! They are our 2012 HHLS Grand Prize winners! Read their story and meet our other winners here. Explore this site to learn why sharks are under threat & help us to avert their extinction by joining the contest or voting for this year’s couples who have pledged not to serve shark fin at their weddings. Make a vow to go Fin Free at your wedding banquet and you could win a FREE honeymoon. 囍 = Double Happiness / Xi or Hei is a special character we use for weddings to illustrate the bringing together of two people in a harmonious match. Let’s bring together harmony for oceans and wedding couples by making our banquets Fin Free. Join the growing movement of wedding couples from around the world who are showing respect for their guests and our oceans by taking an important stand for sharks. Enter here for your chance to experience the Galapagos Islands! *All contest entries are subject to the contest rules. Please read the eligibility criteria.